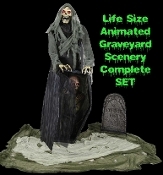 This Halloween haunted house TALKING GRAVEYARD REAPER ZOMBIE PROP horror decor CEMETERY SCENERY SET has it all! The Graveyard Reaper decor set comes complete with a Life Size 5-foot-9-inch (172.5cm) tall Reaper character featuring a soft PVC head with a moving mouth and light-up eyes, a tattered costume with gauze details and blow-molded hands, a fabric-covered wire-framed 36-inch (90cm) tall partial coffin that lights up showing a stuffed-fabric rotting corpse with plastic head and hands hanging on the inside, a fabric-covered 19-inch (47.5cm) wire-framed tombstone, and a piece of green gauze ground cover to help set the scene. Plug in the UL power adapter into any standard outlet and choose from Steady-On, Infra-Red Sensor or Step-Here Pad (included) activation options to operate. The infra-red sensor works up to 6.5-feet away in bright light down to no light! Item includes volume control and easy-to-assemble quick-connect poles. Simple assembly is required. Once activated with your chosen method, the Graveyard Reaper will open the coffin door as his mouth moves while saying one of three evil conversations with the doomed corpse: ‘You are a brave soul, to be treading into graveyards this close to Halloween. I pull more doomed souls into my bony grasp during this season than any other, and it isn't long before you end up looking like this wretched corpse. Aaargh, Death for an eternity. Release me from this torture!’ ‘He takes death so seriously. It isn't all that bad. You get used to it after a few hundred years! Hahaha!’ ‘Look at who comes this way! Do you not fear the Reaper? Perhaps you should if you don't want to have a pine box fitted for you. Aaaargh.’ ‘ He's caught me in his cold, cold clutches. There is no escape! Uhhhhhhh.’ ‘ I think you would look pretty good in a coffin. I'll be by later to talk you into one. Ha ha ha.’ ‘This grave yard is hallowed ground for the dead, once they are buried properly. But if they are dug up, their souls are ripe for the taking! I have been lucky this season, so many souls to take. Perhaps you are next! Ha ha ha!’ Approx 69-inch (172.5cm) tall. Recommended for indoor or covered porch use only.